Fast forward to 2010….. and the latest scientific research which suggests that eating grapefruit contains phytonutrients that protects the body from acids that make us sick, tired and fat. 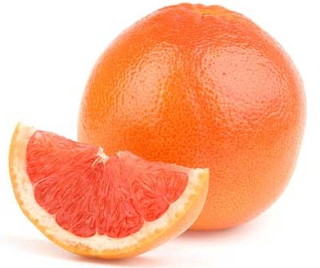 Naringenin, an antioxidant flavonoid which chelates dietary and metabolic acid, is derived from the bitter flavor of grapefruit and other citrus fruit, may cause the liver to chelate acid and release fat while increasing insulin sensitivity. Normally, after a “normal” meal (consisting of carbs, fats and proteins), your blood is flooded with the metabolic and dietary acid called sugar. This boost in blood acid or sugar results in the activation of your Liver X Receptor Alpha – LXRα. The results are the production of healthy fats by your liver to bind up the increased acidic sugar for long term storage – ie belly fat, saddle bags, love handles, etc…. The body does this to protect itself from excess dietary or metabolic acid. The chelation of the acid sugar is good but if not eliminated through the bowels, urine or skin it ends up on you belly, thighs or buttocks. Up until this latest research into Naringenin, the only way to prevent this from happening was by reducing your intake of carbohydrates – via fasting or eating low carbohydrates. acids being released from your fat cells…. causing a reduction in over-all cholesterol production, which is created to bind up toxic acidic sugar. And that’s not all. Another benefit of Naringenin is that your PPARγ receptor is activated – resulting in an increase in sensitivity to insulin. Naringenin...remember the name and the incredible delicious organic pink grapefruit from the Rancho del Sol and the pH Miracle Living Center. Organically Grown at the Rancho Del Sol. 100% organically grown (without synthetic pesticides, herbicides, or fertilizer), Ruby Red Grapefruits from sunny Southern California. These succulent members of the citrus family are grown in Dr. Robert and Shelley Young's private orchard, Ranch Avorado. With its unmistakable flavor, these grapefruits offer a subtle sweetness and signature tartness that everyone can enjoy. Great site. I came over from Katherine's Corner. It is nice to find you. Hi Maria! Thanks for visiting. I hope drop by again some time.